These classic Christmas cookies bring back memories of being really little and so excited for Christmas. My Mom made these every year and was pretty much my favourite of all the Christmas cookies. These are rolled in nuts and finished with a dusting of icing sugar. This particular recipe uses Raspberry jam, but use whatever jam you prefer and don’t be afraid to mix it up. I use an ice cream scoop for the dough to determine the size of each cookie to make sure the balls are all about the same size and cook evenly. This makes about 24 cookies. Cream butter and brown sugar until well blended and creamy. Add Vanilla and mix well. Separate egg yolk and white and set the whites aside in a small bowl for dipping later. Add egg yolk to butter mixture and blend well. Sift flour and salt and add into butter mixture. Mix well with your hands and form into a dough ball. If the dough is very soft I often wrap in wax paper and put into the fridge for about 10 or 15 minutes. Put a piece of parchment paper on two cookie sheets. Take even amounts of dough and roll into round balls and place evenly onto the cookies sheets. I make them about an inch thick. The larger the cookies the fewer you will get in the batch. Using a spoon roll each ball into the egg mixture and roll in the nut mixture and place back onto cookie sheets until all balls are completed. Now using your thumb OR something rounded like a thimble or wine cork, press an indent in the middle of each cookie. Put into oven and cook for about 8 minutes. 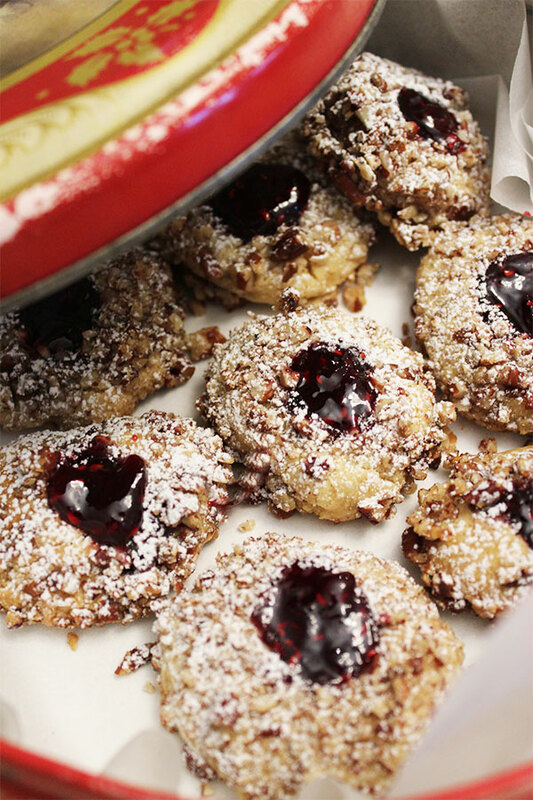 Remove cookies from oven and using a spoon add jam to each cookie indentation. Put cookies back in oven and cook for about 8 more minutes or until lightly toasted on bottoms. Lightly dust with icing sugar.